I sat in on the kindergarten class party planning committee this week. We planned out the kid’s Halloween party, which is going to be monster themed! 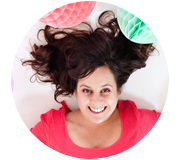 This quickly led me to day dreaming of fun monster sweets – then the most amazing idea struck. And I quickly became obsessed with these awesome guys. 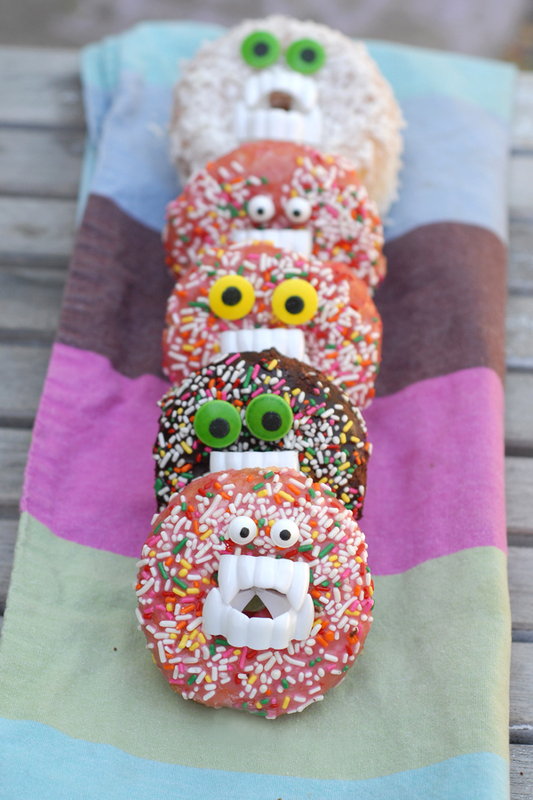 Even though we are not quite into October yet, I couldn’t resist sharing the monster donuts with you. Right now! Because you definitely need to know about them. Right now. 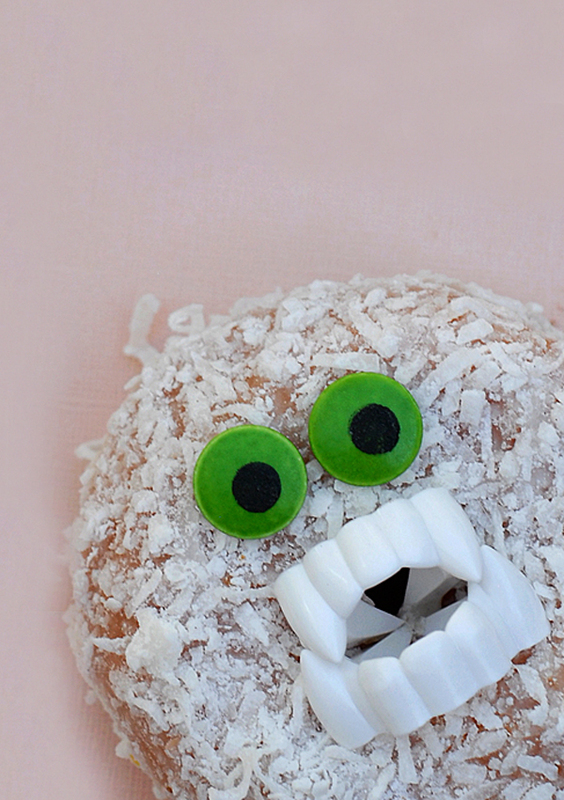 The monster donuts are super fun. The kids went crazy for them! And they took only a few moments to put together. In my excitement for the idea, I found this simple tutorial – it was a major fail for me… So I added a necessary step, and altered it to work. 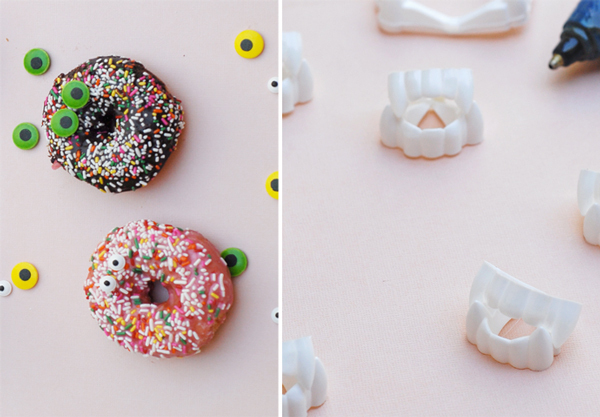 The result is an awesome dose of sweet Halloween fun. 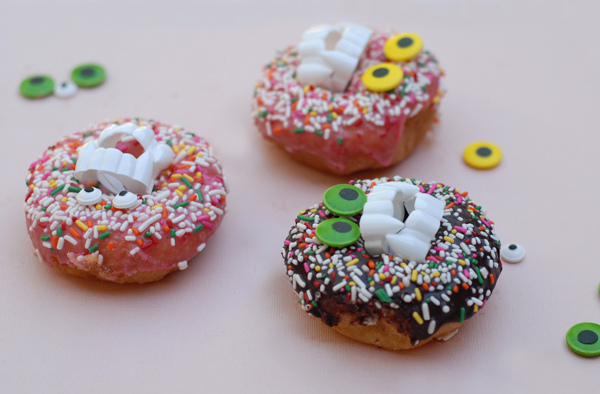 To make the monster donuts you’ll need; donuts, I think the sprinkle variety make it the most fun. 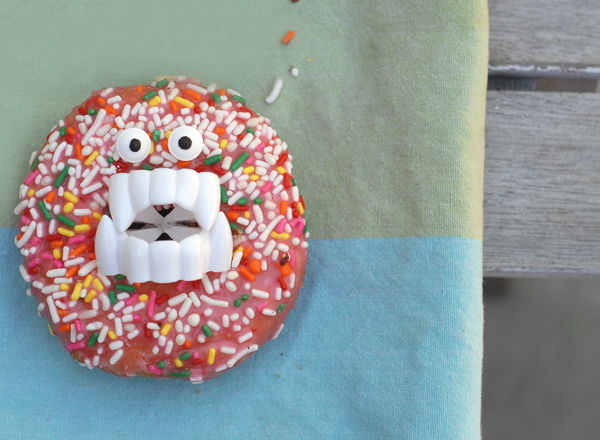 You’ll also need vampire teeth and candy eyeballs – large or small. The first step is to use hot glue to glue the vampire teeth together in the back. 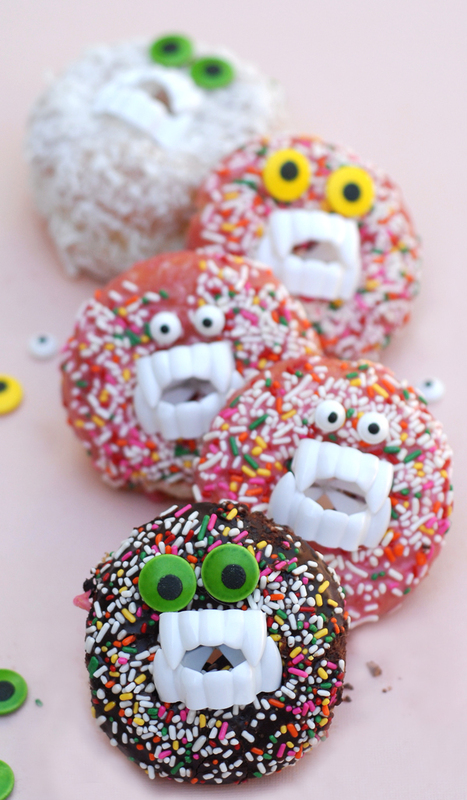 I know this sounds like a weird thing to do, but if you skip this step the teeth will continue to open once placed in the donuts, and the pressure will break the donuts. 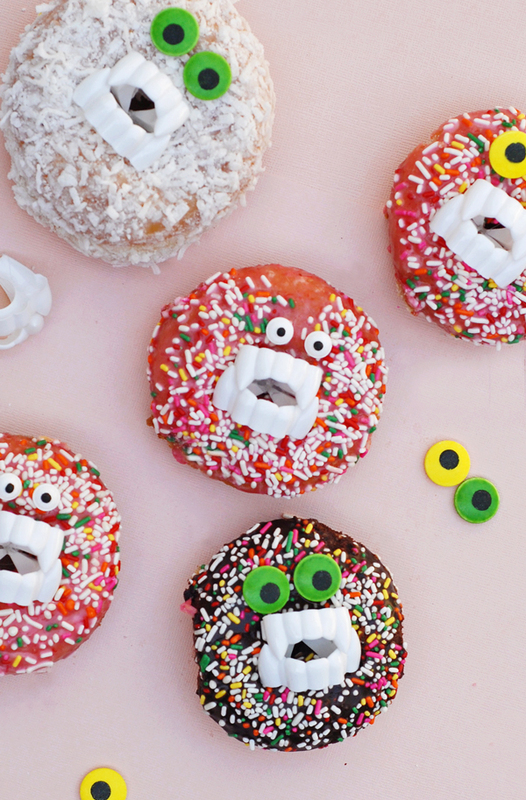 Its an extra minute of time, but it will ensure the festive monsters make it through the day or party still intact. 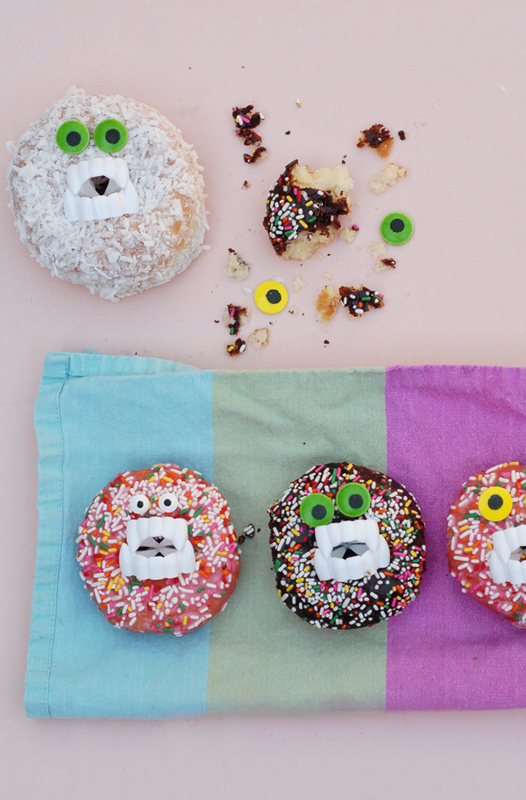 Next, place the eyes on the donuts. If yours are not sticking properly, a dab of corn syrup on the back of each eye should do the trick. Just hold the eyeball in place until it dries. PS. Matt says the white one looks a like the abominable snowman, bonus points for all you Frozen fans. PSS. Check out our huge Halloween craft and recipe gallery. I am trying this idea for my child’s monster theme birthday party. The only challenge I am having is hot gluing the teeth together. The glue seems to melt the plastic before I can press them together. Do you have a resolution for this? Pingback: Saturday | Sum-up + Link Love!